After the success of the top and skirt, I decided it was time to tackle a dress. I’ve made a couple before, but they’ve never really turned out right…and this was no exception. 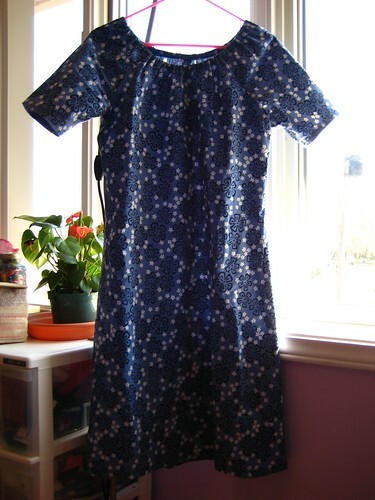 I used Simplicity 3835 again (the same as for the top), view A. What’s wrong with it? Well, I laid out all my pieces and started to cut…and then realized that I’d mixed up two of the pieces. I was able to salvage the fabric and cut out the pieces, but the dress ended up a little short as a result (I want things to cover the back of my knees). It hasn’t been hemmed in that photo. The whole cutting out thing should’ve been a sign, maybe. The sewing went…medium. The sleeves and body were fine, but my darts were a little off from one another and then there was the zipper. Oh, the zipper. The first side went fine, and then the second side didn’t really match. I ripped and resewed three or four times and finally managed to fudge it in, but….not so great. And then there’s the collar. I should’ve realized it earlier, but it’s really tight. Like, chokey. (You can see if more here.) Sigh. And after all that work in gathering the neckline so it would fit. I decided to give the dress another try, with my own modifications – a livelier print (Alexander Henry), no zipper, and the neckline from the top, which is just gathered with elastic. Much better. And from start to finish in 2 hours! 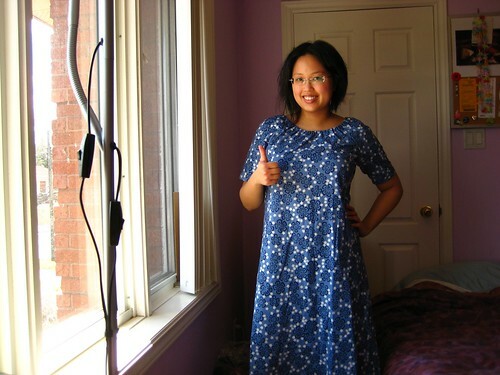 I cut the dress a wee bit longer, too (probably 1.5″) so that it would be the right length when hemmed. My darts were much improved, too. It’s a little shapeless, I suppose, but works well with a belt or a fairly structured over-layer (jacket). And of course, it’s super comfy, so that kind of outweighs some other concerns! So that’s the dress. I think I might stick to skirts and tops for awhile – I find it pretty stressful to sew up a whole dress. But I do have other patterns to try, so I’m sure there’ll be another attempt at some point soon! I’m thinking something with a more structured bodice and flarey-er skirt. We’ll see. Oh! And I almost forgot – the pattern for my skirt from the last post is Butterick B4136, view A. Knitting updates will resume shortly! Oh yay! I’m glad you got one to work out. I thought the first one was pretty cute, but I too would not put up with a choke-y neckline. But then I scrolled down to the second one–that turned out great! I bet it would be adorable with the right belt. That’s so gorgeous. Perfect for the summer. And yes, I think a green (or yellow, maybe?) belt would set it off perfectly. You look great in it! Don’t worry, I remember the first two things I sewed went straight from the sewing machine to the trash can. They were completely unwearable. You’re learning, so you’re entitled to some trial and error. Your second version is so much cuter than the first, I can see you will be sewing up those bodices and flares in no time. If the proportions work, you could always cut the top off the “failure” one —a few inches below the bottom of the armholes —pop in an elastic waistband (or a zipper) and have a fairly serviceable skirt. You’re right, the second one is MUCH better! I would think it would be perfect for hot days, when you don’t want anything sticking to you. That dress is very cute! I’m glad you had better success with the second one. 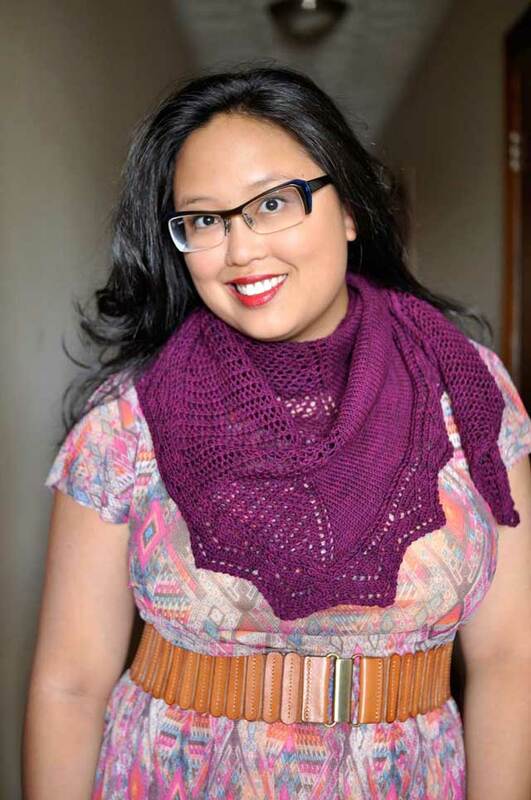 I’m going to have to try this pattern. Oh man, have I made dresses like that before!!! You know what fixed it for me? Muslins. It’s where you make the dress first in muslin and make all the alterations BEFORE you cut your fashion fabric. You then transfer all alterations you’ve made to the paper pattern…it’s brilliant and I haven’t made a crappy dress since. 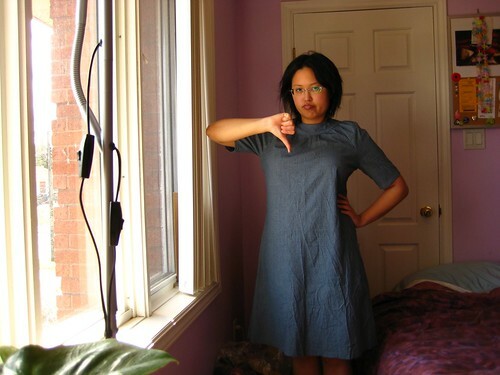 Well, I’ve actually made plenty of crappy dresses, I just “uncrappy” them with muslins before I cut into my good fabric! I am so glad you got the second one to work. It looks great on you but it would look even cuter with a belt or fitted jacket over it like you said. good job for giving it another try. I am glad you like it and it is comfy. Yeah! The second dress is really cute! And more springy-sunny than the grey one! Thumb up too! Good job! I don’t think the first one looks bad, but I was thinking the neck looked a little small in the pattern I have. I’ve made the shirt twice now, after being inspired by you, and I was thinking about doing it as a dress with the shirt neckline. I’m glad to see your version of it. It looks great and comfortable. I may tackle it later this week. Super cute!! I have been feeling the sewing bug myself. Something about spring always makes me want to sew dresses. I have also had success with the Built By Wendy 3964. The top has a really cool diamond placket (only slightly cumbersome) and the end result is always awesome. I actually bought that Built by Wendy pattern based on your finished top. It was so cute, and seemed like a nice basic pattern. So, thanks for the inspiration! i find dresses to be stressful too :) the second one turned out nice! i’m sure you’ll get a lot of use out of it. I agree with Pat J. You can really easily deal with both your length and neckline problems in the same way. For the hem, measure around the bottom of the skirt. Now cut out a piece of contrasting fabric of similar weight and material that is [your measurement]”x[how long you want the strip]” (I’d probably go with 3 inches or so) and add seam allowance to three sides (2 of them being the short sides) and hem allowance to the remaining long side. Now, if you’re sure you did all your measuring right, you can do something very sneaky, hem the piece *before* you attach it! Yay easy! Then just seam the hemmed piece to the bottom of the skirt. You can do basically the same thing with the neck, just measure the opening and decide how much wider you want the neck to be and add that to your measurement. The one fiddly thing is that depending one how high or low the yoke sits, it may need to be angled at the seams to sit flat but you can fix that once you’ve sewn the piece on. And if you’re really feeling crazy, add the edging to sleeves and/or make a belt! OK, I realize that was perhaps a bit more long winded than necessary, but I hate to see people scrap an entire project just because it’s not exactly what they set out to do. Think of it as a sweater that you knit, and then hate, but decide to add a cool edging just for the heck of it and it becomes your favorite sweater. Very nice! I’ve started doing zippers by hand after much stressing over sewing in zippers by machine. You pin everything together, then “prickstitch” (which is a modified backstitch that I’m sure you can find on the internet) by hand. Sounds long, but I did a long zipper in about 20 minutes. I’ve made a vow to do all my dress, skirt, and shirt zippers by hand now (and try to convert others!). You’re really inspiring all of us with these sewing projects! But it is not that bad…. Other suggestions: i would look for other design of dresses that you may not find attractive at first that may suit you better than you thought.. I haven’t seen a lot of women on which the first collar fit was right..
Great job! Both dresses look super comfy, but I love the fabric pattern on the second one. I also think the first one looks pretty good, maybe if you add a bit more fabric to the bottom to make it the length you like and then add some embroidery to that area ot outline it in a bright colored yarn to spice it up! A+! I would’ve scrapped the entire endeavour after the first dress. The second one looks great, and I cannot believe you whipped it out in only 2 hours! Hm. I think the grey one would look good with a wide colorful belt. Or maybe not a belt, maybe a knitted body wrap thingy of some kind, reddish in color. I wish I could sew. Sigh. Love the second dress! I bought the pattern based on your shirt post. Thanks for the inspiration! Ach. It’s hard to make a good dress at times. I still have all of the clothes I’ve sewn, but a lot of them had major problems. You seem to be getting past the learning curve pretty quickly and making a lot of cute tops, etc. Gah! You are just gorgeous in both the dresses… Do you want to fly out to Boston and make me some?! I think you did a great job on both of them, but I can see how the first one looks uncomfortable. The lower neck line looks way cute anyway! I always find myself rushing into getting a dress or skirt cut before double checking my measurements, and I always end up fudging with the results. Got to remember to take a deep breath and go slow! You look adorable in both, actually, but I know the feeling — you actually made a good one. I can’t seem to make a dress I’d wear out of the house to save my life, although skirts are simple as pie. Good on you! You look great in the print. I’ve sewn a few dresses in my time, and it’s curious, but the “simple” ones are harder to fit. I think it’s something about the drape–sometimes they just hang there looking shapeless. It seems that the more structure (pieces, darts, etc.) the more freedom you have to adjust. The dress looks great! can you tell me where you buy your patterns? I have been having a doozy of a time finding a retailer. Love looking at your sewing. I’m so impressed that you ripped the zipper out three times. I never did that when I was sewing and it often showed. Have you ever tried a simple Vogue pattern? If you have I haven’t read that particular post, sorry. But I recommend them. They’re not hard and you learn a lot from them. Butterick, of course, is the next best thing. Sew on! love it! I have a bunch of clothes items cut and ready to sew but my new to me machine and i have not been on the friendliest of terms…poor hubby who talked me into giviong my loved machine away when we moved! You know, the first dress you modeled would look cute with a knit tank type, vest cover up i always see. They look so cute but i always wonder what to wear them over…that dress would look very cute with one!